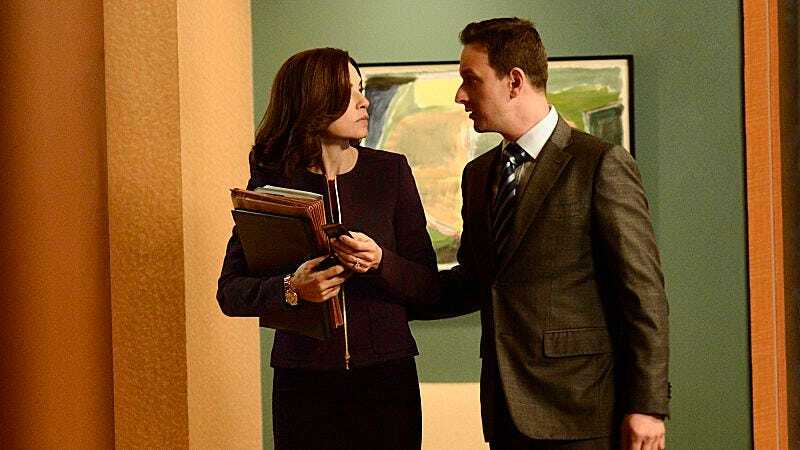 The Good Wife: "A Precious Commodity"
Watching The Good Wife this week, I felt like a kid whose parents are fighting in front of him who keeps whacking his head asking them to stop. In one week, Diane and Will have gone from being eternal whiskey-sipping bros who sit on piles of money and declare each other emperors of cool to a couple of bickering lawyers negotiating an exit deal. I hate that this is all because of one dumb interview Diane didn’t have to give. This fight doesn’t have the epic, inevitable feeling that a fight like this should have. It’s a sad, sad sight to see. Diane immediately tells Will about the nasty interview she gave, and the blowback is quick, with clients and lawyers getting called to confirm her tales of Will’s misdeeds. The other partners move to strike and remove Diane as quickly as possible, before she’s even confirmed to the bench. But Diane has the advantage of all her clients and demands, at the very least, a gigantic pile of money to go out the door with. But as Will realizes at the end of the episode, she’s not just trying to get what she’s worth. She’s trying to halt the end of a beautiful friendship. When Will coldly asks her how much money she needs to leave, Diane knows it’s over. It’s a brutal moment to watch, beautifully acted by Christine Baranski and Josh Charles. Oh, why do they have to fight? I hate it, guys. I hate it. I also wonder what the endgame is. The Good Wife is doing what it does best right now—spinning so many storylines with so many possible conclusions you genuinely don’t know what will happen next. Where will everything land? Will Diane become a judge and patch things up with Will, or will she move to Alicia and Cary’s new firm? Will Alicia join Cary? All signs point to yes by the end of the episode, even though Will offers her Diane’s senior partnership. But how can Alicia not jump ship? “A Precious Commodity” is a showcase of everything that Alicia can’t stand about her current firm. The partners are either fossilized fools like Howard Lyman (Jerry Adler) or venal sharks like David Lee. Their treatment of Diane is sadly not even that shocking, and their opinions on the case of the week, a peculiar battle centered around surrogacy and abortion, are lost in the stone age. The case is a fascinating one: Tara (Genevieve Angelson) is a surrogate for Kathy (Janel Maloney) and her husband, carrying a fetus created from their genetic material. The fetus is diagnosed with terrible birth defects, and the parents move to abort, but Tara turns them down, saying the baby is still kicking and that she doesn’t want to let it die. They sue her for breach of contract, essentially looking to force her to terminate, which Alicia finds to be a shocking enough concept that she represents Tara pro bono. The case itself is relatively open-and-shut, I think, although I am no lawyer—it is difficult to imagine a court compelling a pregnant woman to have an abortion against her will. So the case is clouded with other issues to stretch it out. David Lee jumps on board, looking to sue the hospital he thinks caused the birth defects. Tara’s integrity is repeatedly called into question, although that’s neither here nor there on the matter of her control of her own body. Legally, it seems simple, but ethically, it is tricky, and Maloney does well to invest the audience with sympathy in her character even when her side becomes more villainous. The Good Wife can always make a case of the week nuanced and shade it with grey, even when the issue at hand is one as volatile as abortion. There’s some other business that’s a little less compelling. Grace is flattered at the attention she’s getting, even though Alicia is horrified. I am nervous about where this storyline will go next. Peter re-hires Melissa George to the ethics board, realizing his mistake, and then immediately flirts with her (Eli was right, dammit). I mean, I think he flirts with her. Chris Noth and George do not have a ton of chemistry, it must be said. Peter immediately runs to Alicia and says they have to renew their vows post-haste, as if that’s going to solve everything. You have a problem, dude. It’s long past time to admit it. Man, I’m mostly just excited for next episode. Can Alicia and Cary leave the firm already!? I want to see the new state of things. Will Kalinda jump ship now that she knows Alicia is fleeing? Can we see Will in his all-black running suit again? What’s Diane’s next move? 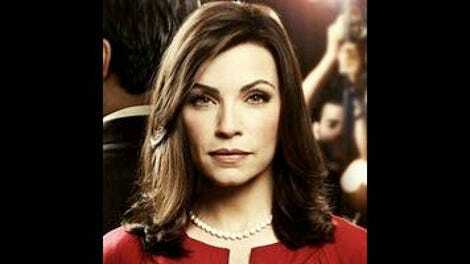 Oh, Good Wife, you pretend to be a simple lawyer show, but these cliffhangers are stupendous. Man, David Lee is such a snake. The show went from strength to strength in making him a full-time cast member.